Hey guys! 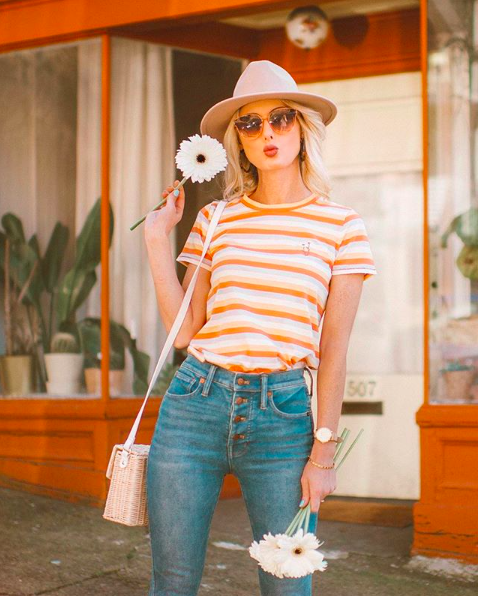 Wednesday's here and she's bringing the spring inspo with her. So many trends are happening right now and I'm personally feeling all of them, haha. The wide leg pant, dresses with sneakers, button fronts and button flies, straw bags and pretty prints and patterns all have my attention. These street-style inspired looks show you exactly why they do. I love the fresh feel they bring to the start of a brand new season. They're such a welcome change from the cold winter doldrums. This dress is one of my current faves. I love the fresh colors, puffy sleeves and bow detail. The retro feel gives it a quirky sense of glam. Statement bags in geometric shapes are popping up everywhere. This one is so cute! And dressing down a springtime frock is a trend I can get behind. That's casual chic at its best. What about you all? What spring trends are you all loving right now? Hope everyone's having a fun week!